Spend your vacation here in the Zellertal amid the untouched nature of the Bavarian Forest. 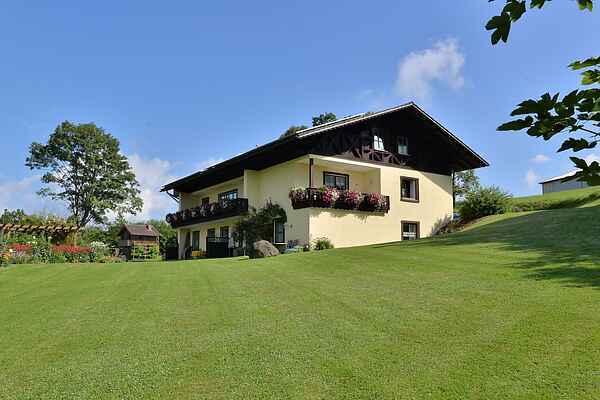 This beautiful house is located in a wonderful location on the edge of the village among meadows and forests. The surrounding mountains and the varied landscape offer you a variety of options for spending the best days of the year. Ideal to flee from the daily stress and to simply relax. Enjoy your vacation with long hikes in the vicinity or just lounge in the well-groomed garden. The bright and completely furnished apartment is located on the first floor and has its own terrace with garden furniture. An infrared sauna, solarium and fitness equipment round off your stay. Discover the numerous leisure activities in summer as well as in winter: fishing, balloon flights, horse sleigh rides, tennis, golf, riding and much more. The closeness to the Bavarian Forest offers a range of excursion options, including the Glasdorf, Waldwipfelweg, mine, zoo, national park or the interesting cities of Ratisbon and Passau. Come and experience it for yourself.